Thermal evaporation is a common PVD process. 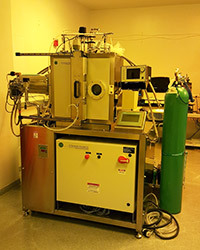 Under vacuum, material is heated, driving increased vapor pressure and thus depositing onto the substrate (in fact, on all surfaces in the chamber). Substrates may vary from small pieces to entire 4" (possibly larger) wafers. Deposition rates are typically 1-3Å/s. The instrument has four sources so up to 4 materials may be deposited without breaking vacuum. The microfab supplies material and boats for Al, Ti and Cu. Other materials/boats (Au, Cr for example) must be supplied by the user. Allowed materials are Si, glass, Al, Au, Cu, Cr, Ti, and fully cured photoresists. Other materials will be considered on a case by case basis. Storage for user supplied materials and boats is available. The tool requires training with an experienced user and formal checkout with laboratory staff.